Cru is about giving students an opportunity to hear and respond to the gospel of Jesus Christ. We want to provide a place for students to grow in their faith, no matter their spiritual background, and to be challenged to continually surrender their lives to Christ. With Cru, you will have opportunities to spread the gospel locally, nationally, and globally. Cru sends students to Alaska, New York City, South Asia, and all over the world! Apply to be on Servant Team for the 2019-2020 school year. Due May 1st! Are you an incoming UC Davis student interested in joining Cru? Send us a message and a Cru student will get in touch with you! We meet weekly to praise God and learn more about Him in community with one another. Community Groups involve Bible study and more. Join a group of students gathering around the gospel, learning about Jesus Christ, and taking action because of Him. 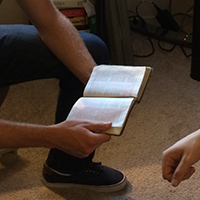 As a community, we get together every week for prayer, evangelism, and more.